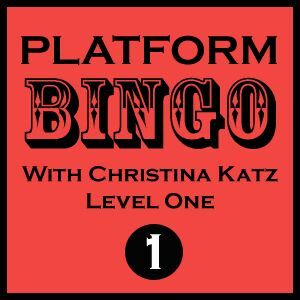 Platform Bingo With Christina Katz gives writers in any genre step-by-step instructions on how to construct a unique, up-to-date platform every day for 24 days. • Help creating the most up-to-date platform you possibly can. • Daily instructions for how to create the best platform for you at this juncture in your career. • Lots of guidance and encouragement along the way. • A deadline: your goal is to complete 24 assignments in 24 days that will have a major impact on your first or current platform. • The opportunity to receive a critique from Christina Katz if you complete all 24 platform lessons. Hope you can join us for 24 daily platform exercises, which begin anew every month of the year except June, July & December.